At the Cathedral Cemetery in St Boniface is the grave site of the Lagimodière family - Jean-Baptiste and his wife Marie-Anne Gaboury. 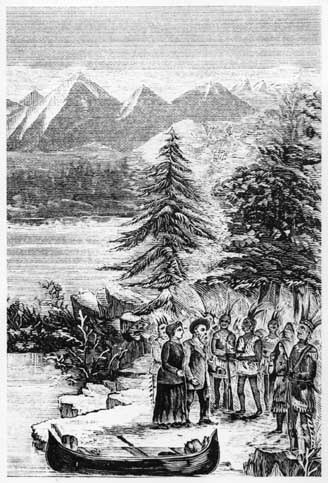 Jean-Baptiste was born in 1778 and would become a voyageur in the fur trade. He and Marie-Anne married in 1805 and moved to the Red River Settlement where he was a hunter and trapper and frequently acted as messenger for the Hudson's Bay Company. They had 11 children, one of whom, Julie, would marry one of their neighbours, Louis Riel Sr. In 1844, she gave birth to Louis, who would grow up to be a celebrated and controversial Metis leader. Marie-Anne Gaboury (born 1780) was known not only as the grandmother of Louis Riel, but also as grandmother of the Red River. Many Metis can trace their ancestry back to her. From a life in domestic service to the parish priest, she and her new husband embarked on an arduous journey through Quebec, Manitoba, North Dakota and the Northwest. She was said to be the first white woman to live in western Canada. The semi-nomadic life with other French Canadian fur traders and their native wives would have been challenging and dangerous yet she lived to an impressive 95 years of age. Makes it look as though the people in the grave are stacked up like cordwood underground. My goodness. She was a strong woman -- I doubt any of us today could go through what she did and survive another year!! This is a wonderful post. I thoroughly enjoyed reading the history behind the picture and postcard.